The wedding of Prince William, Duke of Cambridge, and Catherine Middleton took place on Friday, 29 April 2011 at Westminster Abbey, London. Prince William, second in the line of succession to Queen Elizabeth II, first met Catherine Middleton in 2001, while both were studying at St Andrews University. Their engagement, which began on 20 October 2010, was announced on 16 November 2010. The build-up to the wedding and the occasion itself attracted much media attention, with the service broadcasted live around the world, and with it being compared and contrasted in many ways to the last high-profile British royal wedding in the United Kingdom, the 1981 marriage of William's parents, Prince Charles and Lady Diana Spencer. It was watched by a global television audience of over two billion. Much of the attention focused on Middleton's status as a commoner (i.e., not of royal blood or a part of the aristocracy) marrying into royalty. Hours before the service, William was granted the titles of the Duke of Cambridge, Earl of Strathearn, and Baron Carrickfergus by the Queen. Upon her marriage, Middleton therefore became Her Royal Highness Princess William Arthur Philip Louis, Duchess of Cambridge, Countess of Strathearn, Baroness Carrickfergus, but is not styled as 'Princess Catherine'. This book is your ultimate resource for The Royal Wedding of Prince William and Catherine Middleton. Here you will find the most up-to-date information, analysis, background and everything you need to know. In easy to read chapters, with extensive references and links to get you to know all there is to know about The Royal Wedding of Prince William and Catherine Middleton right away, covering: Wedding of Prince William, Duke of Cambridge, and Catherine Middleton, Prince William, Duke of Cambridge, Catherine, Duchess of Cambridge, Drottningholm Music, Landshut Wedding, List of royal weddings, List of wedding guests of Prince William of Wales and Kate Middleton, List of wedding guests of Prince William, Duke of Cambridge, and Catherine Middleton, Wedding dress of Kate Middleton, Wedding of Charles, Prince of Wales, and Camilla Parker Bowles, Wedding of Charles, Prince of Wales, and Lady Diana Spencer, Wedding of Haakon, Crown Prince of Norway, and Mette-Marit Tjessem Høiby, Wedding of Pavlos, Crown Prince of Greece, and Marie-Chantal Miller, Wedding of Prince Albert, Duke of York, and Lady Elizabeth Bowes-Lyon, Wedding of Prince George, Duke of York, and Princess Mary of Teck, Wedding of Princess Elizabeth and Philip Mountbatten, Duke of Edinburgh, Wedding of Victoria, Crown Princess of Sweden, and Daniel Westling. 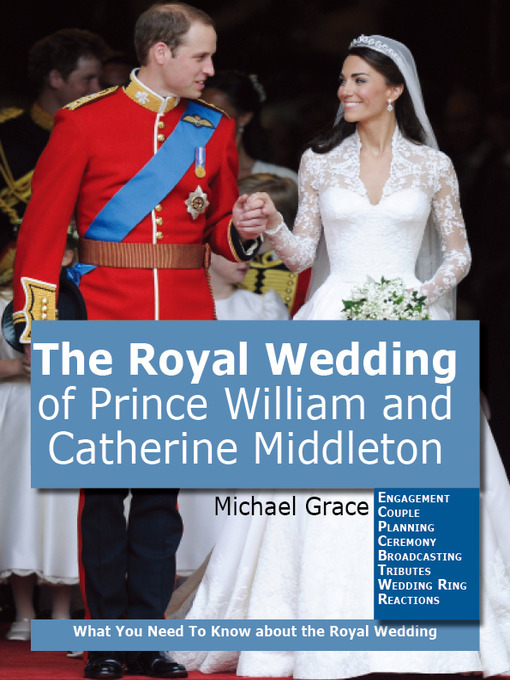 This book explains in-depth the real drivers and workings of The Royal Wedding of Prince William and Catherine Middleton.